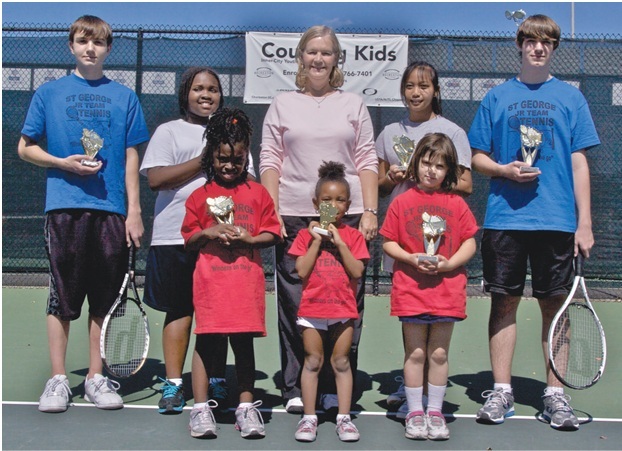 Thirty two players from St. George recently took part in a day of tennis competition at Charleston Tennis Center, with seven local players winnning trophies. Peggy Bohne is manager of the center and coordinator of the tournament, which is held in conjunction with the MOJA Arts Festival, a celebration of African-American and Caribbean Arts. All players were treated as winners and enjoyed a pizza party afterwards. Local volunteer coaches participating were Amy Limehouse, Charles Smoak, Daniel Walters, Dion Straub, Mary Thomas, and High School Coach Gladys Summers. Barbara Jones, coordinator of St. George Junior Team Tennis League, said that the kids, parents, relatives, and friends who came out to support the local players had an exciting day of fun. Front Row, L-R: Maxlin Bridge, Sarah Smoak, Kaleshia Green, Sanoe Lester, Claire Fischinger, Gabrielle Limehouse. 2nd row: Jasmine Williams, Taariq Lester, Meagan Simons, Christopher Williams, Kimani Green, Makayla Cobbs, Brianna Smalls, Blair Floyd. Back Row: Darsheen Rhett, Michael Chassereau, Steven Ahlers, Alex Stout, Allen Shuler, Maia Wilson, Elizabeth Brondesema, Courtney Simmons, Ronika Elmore, Tiffany Wallace, Nassim Benaissa, Tromaine Cobbs, Jordan Beard, Angel Shuler, Nailah Lester, Savon Garrett. Not Pictured: Emily Floyd, Yoku Kojimoto. Back Row, L-R: Steven Ahlers, Courtney Simmons, Peggy Bohne, Tennis Manager of Charleston Tennis Center; Yoku Kojimota, Michael Chassereau. Front Row: Kaleshia Green, Sanoe Lester, Claire Fischinger.